Packers Coaching Staff Complete ~ The Bucky Channel - The World of Sports from Wisconsin's Perspective. 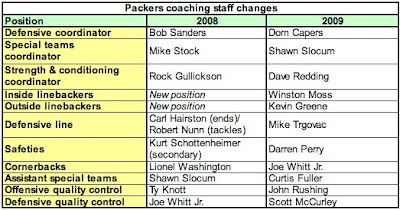 The Packers coaching staff is complete after a couple of hires on Monday. I was going to make a little graphic to show you the new staff, but Greg A. Bedard from the Journal Sentinel already took care of that. So I will link him as a thank you, and then steal his graphic. Because that's how blogging works!